Organization that operates independently from any form of government. is any non-profit, voluntary citizens’ group which is organized on a local, national or international level. Task-oriented and driven by people with a common interest, NGOs perform a variety of service and humanitarian functions, bring citizen concerns to Governments, advocate and monitor policies and encourage political participation through provision of information. There is a focus on human rights, environmental, or development work. Some are organized around specific issues, such as human rights, environment or health. They provide analysis and expertise, serve as early warning mechanisms and help monitor and implement international agreements. The World Bank classifies NGOs as either operational NGOs, which are primarily concerned with development projects, or advocacy NGOs, which are primarily concerned with promoting a cause. In many cases, the NGOs are misused by donors to fulfill Donors agenda even if it is against the national agenda. BINGO (business-friendly international NGO or big international NGO); the Red Cross is one example of a BINGO. ENGO (environmental NGO); the World Wildlife Fund is one example of an ENGO. GONGO (government-operated NGO), by definition not an NGO but an organization created by a government to resemble an NGO to further some agenda. 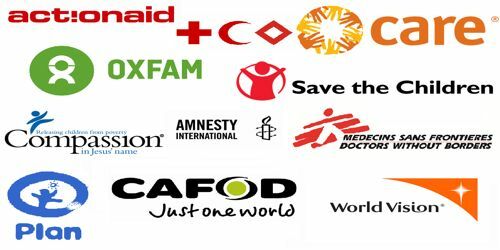 INGO (international NGO); Oxfam is one example of an INGO. QUANGO (quasi-autonomous NGO), an NGO which may have some governmental members; the ISO is one example of a QUANGO. RINGO (religious international NGO); the Catholic Relief Services is one example of a RINGO. 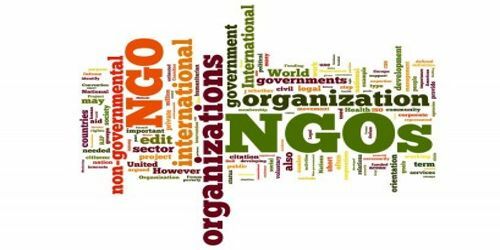 Other NGO acronyms include DONGO (Donor Organized NGO), TANGO (technical assistance NGO) and MANGO (market advocacy NGO). Oxfam: Oxfam is an international confederation of 17 organizations networked together in 92 countries, as part of a global movement for change, to build a future free from the injustice of poverty. Non-governmental organization (NGO) movements to alleviate poverty, protect the environment, or advocate for human rights are widespread throughout the developing world, and, as of 2002, are estimated to account for over 30% of international development aid. While many of the smaller NGOs in this group are seen as providing positive, uplifting services to local communities, larger multi-national examples of social organizations are prone to the same types of endemic corruption as other corporate entities. As well, NGOs often promote ideologies such as equal rights for women that are in direct conflict with a local government’s political aims.